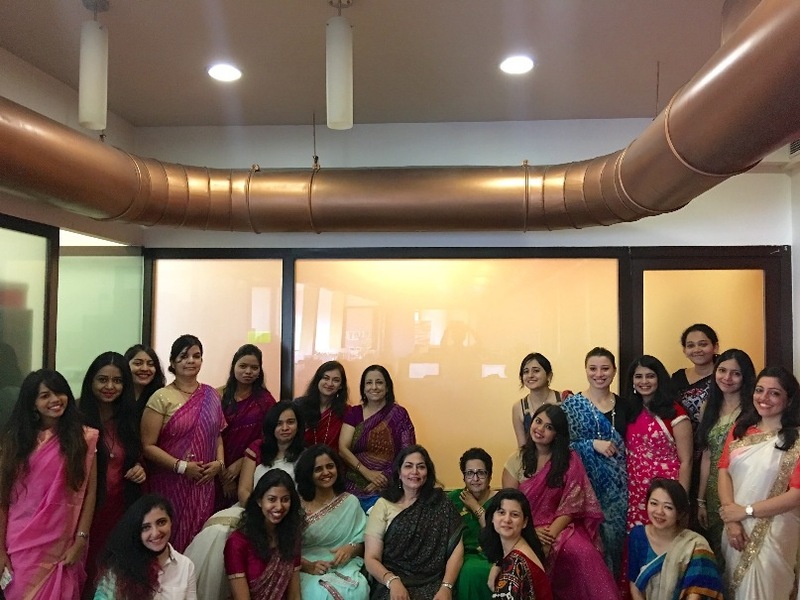 VERVE REVIVAL: WHEN 23 WOMEN AT VERVE WORE SARIS! Text by Sadaf Shaikh. Photographs by Prateek Patel. 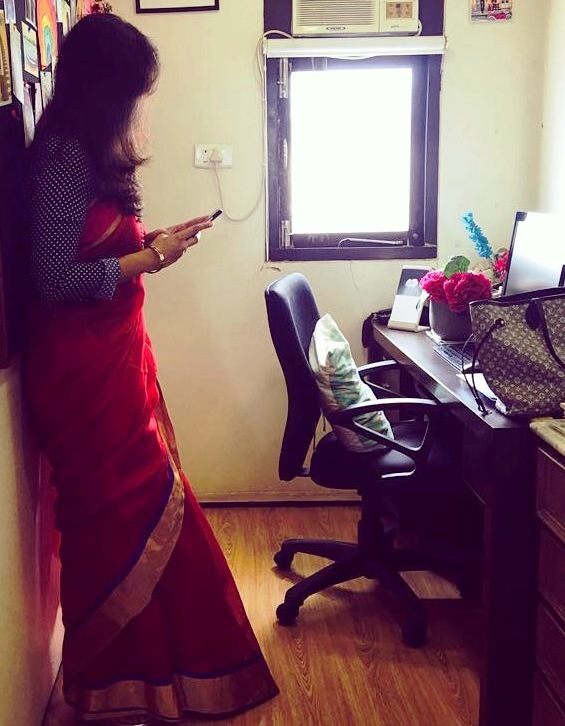 Some of us exulted in wearing the sari while others struggled to keep it from unraveling..
3 months ago, a fortuitous conversation with a marketing executive left our digital editor ruminating on the challenges of wearing a sari in daily life. 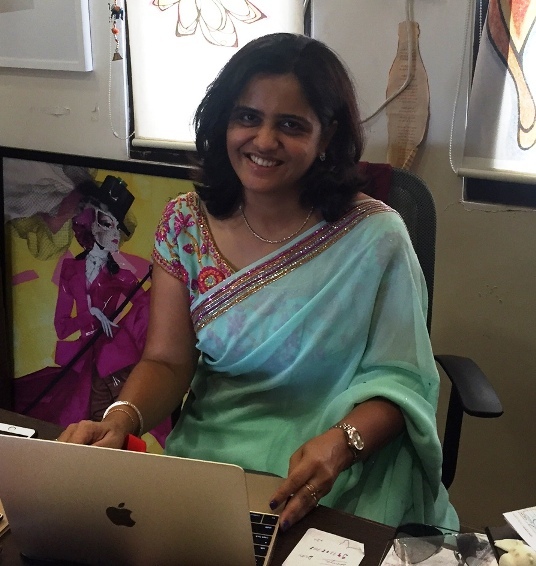 Inspired by the adage ‘experience is the best teacher’, she stepped out in one, and spent 10 breezy hours with approximately zero trouble maneuvering her way around the office (and the city). 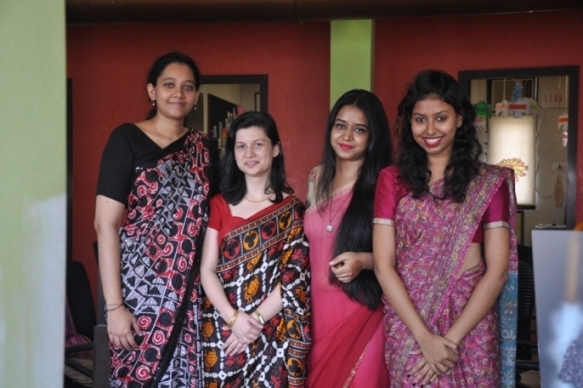 3 months later, after cajoling (and bullying) her colleagues and into dedicating one day each month to reviving the sari, 23 women from Verve turned up in their own renditions of the eternal Indian classic. If you thought wearing a sari is all about running across a verdant field towards your lover, think again. You could probably trip on your pallu and fall rather horrendously at his feet instead of in his arms. Alternatively, your sari could also come undone if you took one wrong step; six yards of magic could quickly turn into six yards of horror. The uninitiated among us grappled with misgivings about commuting to work and going about their day normally. Some of us even had to hike ours up all the way up to our knees while driving. Then there were others whose heels weren’t high enough and so they ended up stomping on their intricate embroidery every few steps. 8 hours (and few re-draping sessions later), the Verve team transformed from their regular office personas to women who could take on the world one pleat at a time. 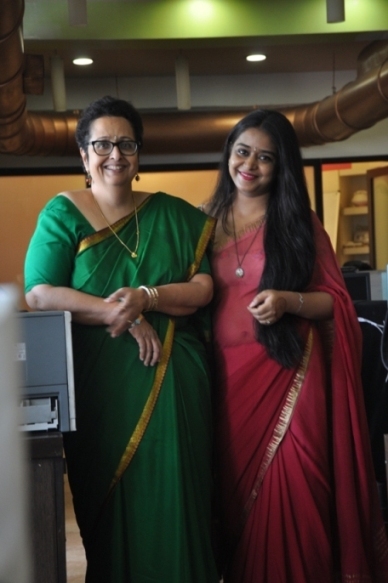 While many of us who didn’t own saris went berserk searching for one, the enlightened simply turned to the most resourceful women in their lives. 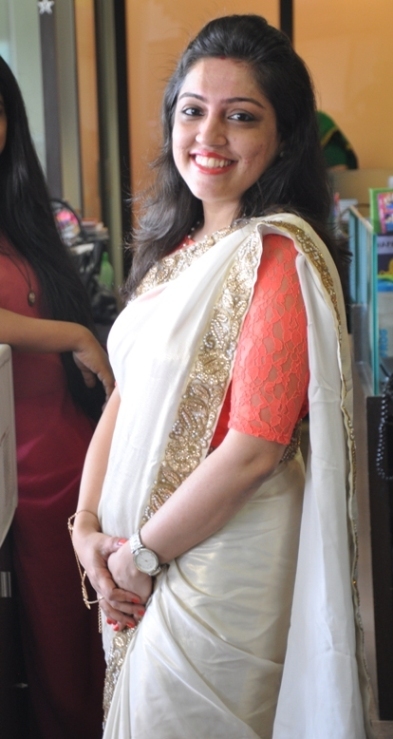 Natasha wore her mother’s wedding sari, teaming it with a casual blouse that made it office-appropriate while Saumya opted for one from her mother’s trousseau. 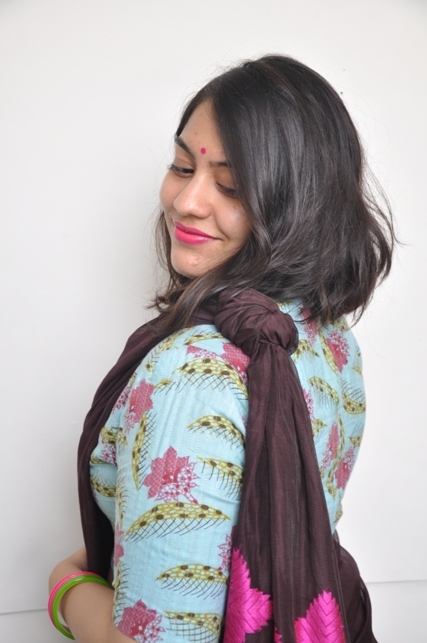 Huzan, our resident Bollywood fiend, went as far as slipping into her grandmother’s 40-year-old sari from Shimla. Zaral’s mother looked shocked, to the say the least, and couldn’t figure out what had happened to her normally jeans-clad daughter. These saris were the real winners, making for endearing back stories. 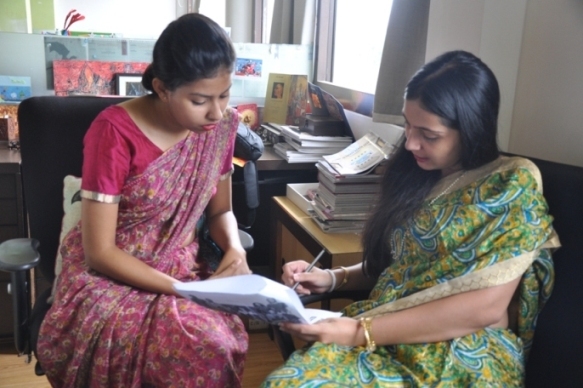 Saumya's mother graciously lent her a sari from her prized wedding trousseau. 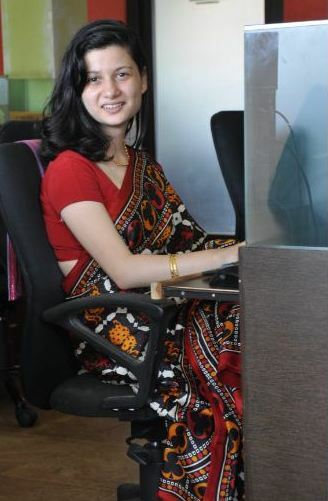 Huzan opted for a sari from Shimla that had been preserved by her grandmother for 40 years. 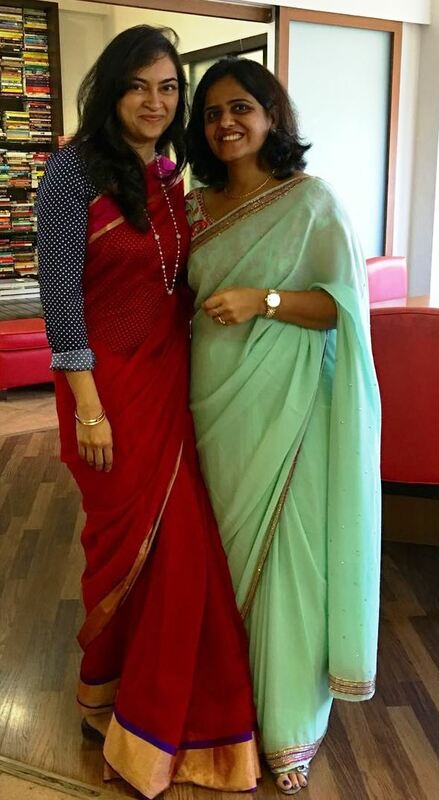 Natasha's flaunted a sari that was worn by her mother during her own ring ceremony, 27 years ago. Some went back to saris which had been gathering dust. 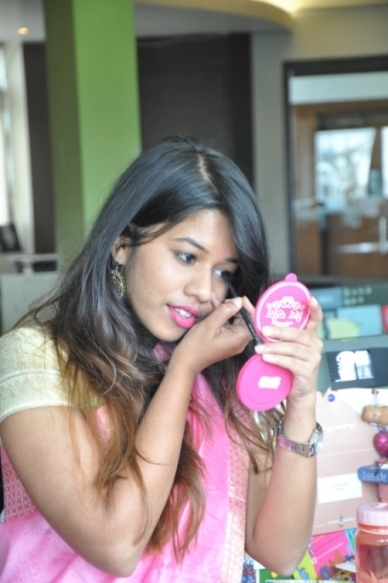 Falguni and Nisha went back in time by reaching for their bridal trousseau. Falguni hadn’t worn this one ever – and she has been married a decade! Falguni Kapadia in a never-worn-before sari from her wedding trousseau that was gifted to her 10 years ago. Some of us couldn’t work the blouse, so we did the next best thing. 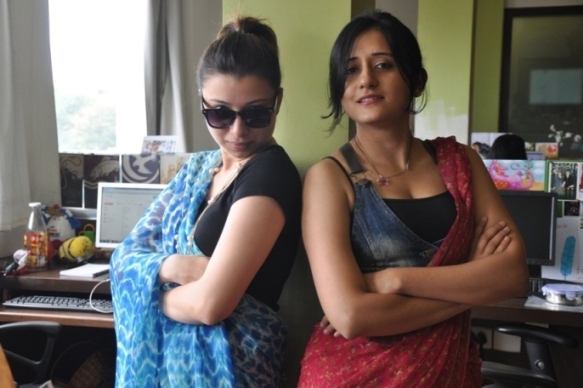 We did wear the sari — our editor made it pretty clear that there was no circumventing that Herculean task — but we lent our own little quirks to it. Sitanshi paired her Raw Mango weave with a polka-dotted long-sleeved work shirt while Preksha draped hers around a rock-chic denim corset. 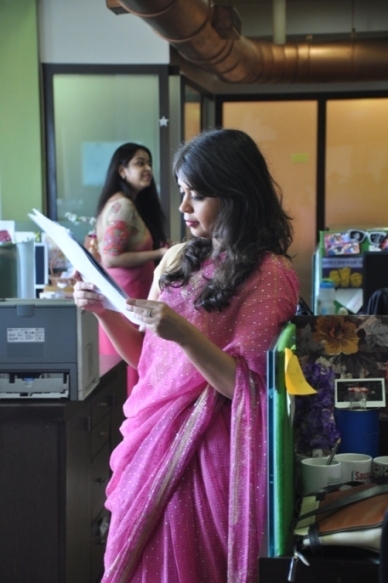 I wore my sari-skirt with brogues and fluorescent pink socks, retaining my penchant for androgyny. Sitanshi Talati-Parikh paired her Raw Mango weave with a polka-dotted long-sleeved work shirt. Preksha Sharma in a rock-chic denim corset. 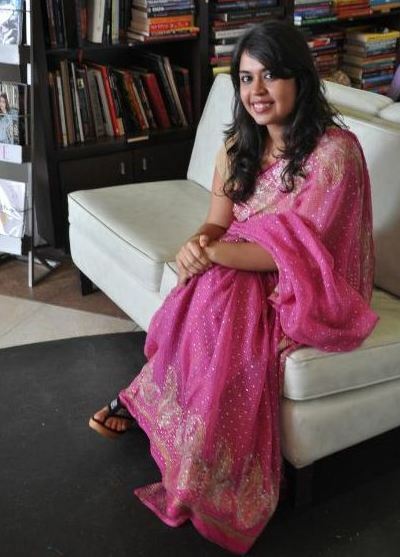 Sadaf Shaikh paired her sari-skirt with brogues and fluorescent pink socks. 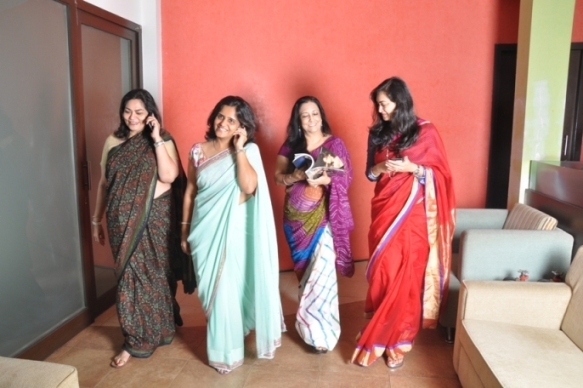 You can’t miss the elements that made the sari personal and very individualistic. 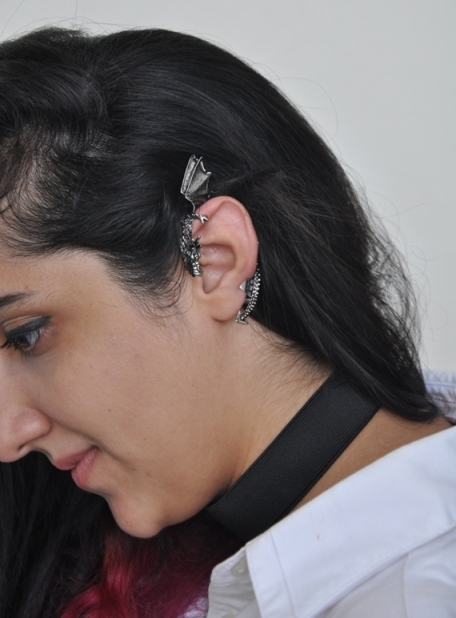 The knotted pallu, the dragon silver earcuff and felt choker…. 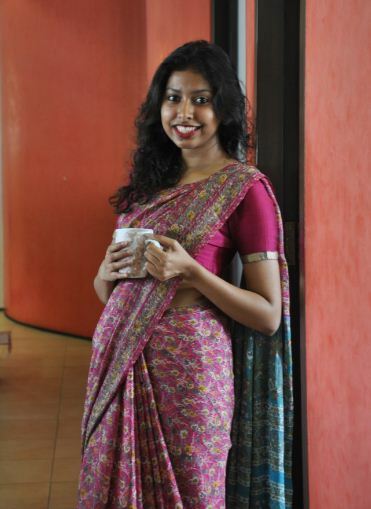 Tanisha replaced safety pins with this knotted pallu that kept her sari place the entire time. 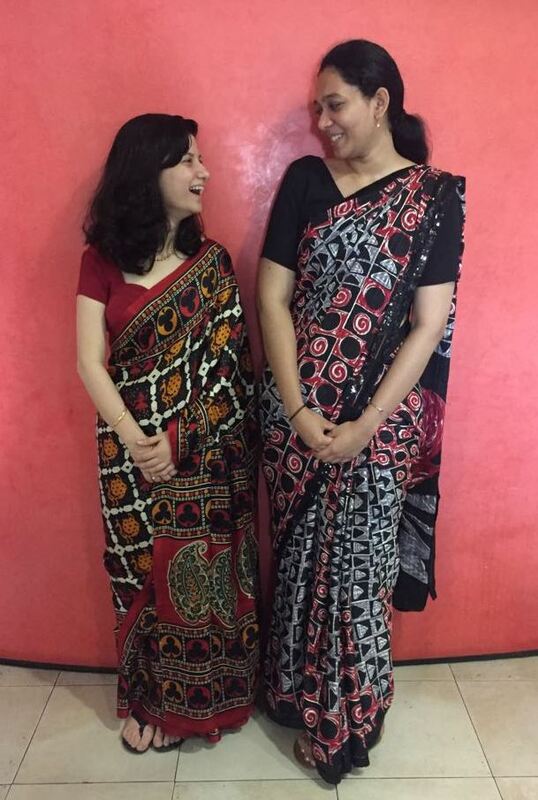 Needless to say, the best part was that women who wouldn’t think of wearing the sari agreed that it is a garment of worth, and would be happy to include it in their wardrobe more often, albeit in their own style and with their own touch. 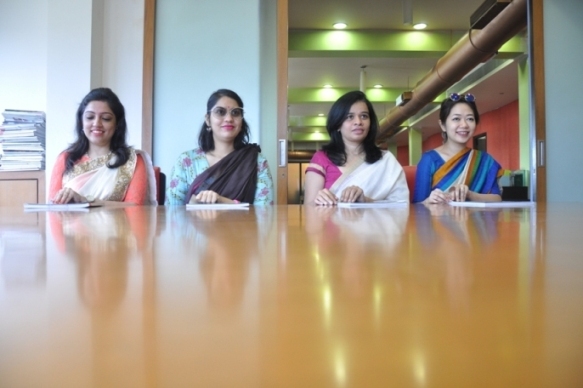 Cheers to many more such days at work – if not for anything but the rollicking Boomerang clips and videos.